We’ve all heard about the benefits of content modeling and structured content for technical information. We’ve implemented DITA or other topic-based strategies to break content into smaller blocks to manage and publish, but topics are not small enough. But the addition of Bots, voice-enabled interfaces, and AI means we must change the way we structure content. We are moving from a broadcast style of communication – publish and hope for the best – to a more conversational style of communication. More question and answer. This imposes requirements on the content models you need to create if you want to talk to the Bots. We must be more granular in our models. We need to implement Microcontent. Join Val Swisher, sitting in for Scott Abel, The Content Wrangler, and her special guest, Steve Manning of Precision Content, for this webinar. 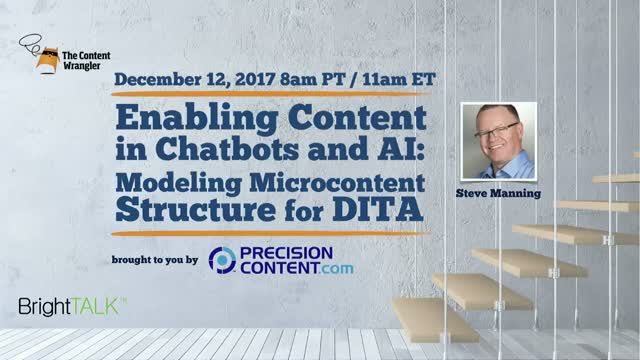 Steve will discuss how new technology will change the way we approach content and the topic-based approach to deliver what you need for the new technology challenges. Steve will work through a different approach to the content that focuses you more on reader outcomes how that affects your content models. Attendees will learn how deep into their content then need to model to get the most from chatbots, voice-enabled systems, and ultimately AI. Attendees will also learn 1) Why traditional topic-based DITA is not granular enough for the future; 2) How microcontent is a better approach to future-proof your content, and 3) How to use user outcomes to drive models and granularity.